As the seasons change, I like to access how far the trees have developed in any given year and plan for the upcoming year’s development. So far I have reviewed some of the major trees in the collection that had considerable work done on them this year. 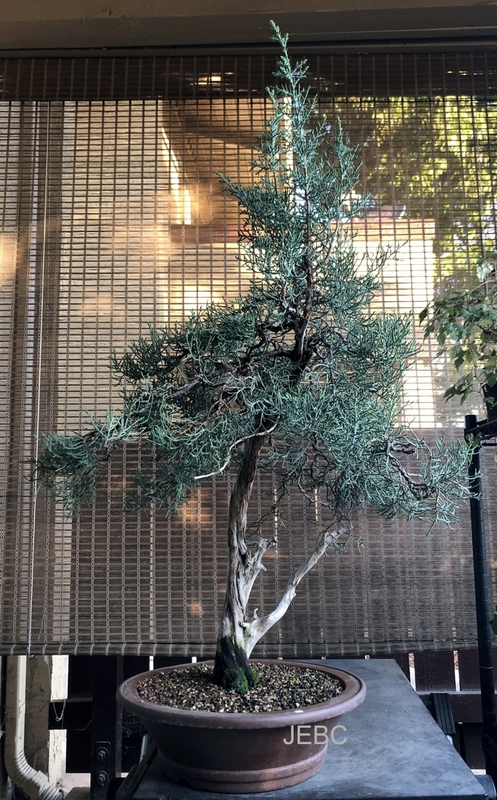 The most challenging species for my location are the Shimpaku junipers; these are very slow growing and patience is required to allow the foliage to clump before it begins to elongate for branch development. It seems like a painful process of waiting and sometime I concur. Waiting several years for that growth to happen means that beyond re-potting and some thinning there is little that can be done in the design. This old Shimpaku was originally styled from nursery stock. It has gone through some trauma with spider mites and excessive heat. It is coming back now after years of care and starting to finally elongate for design. 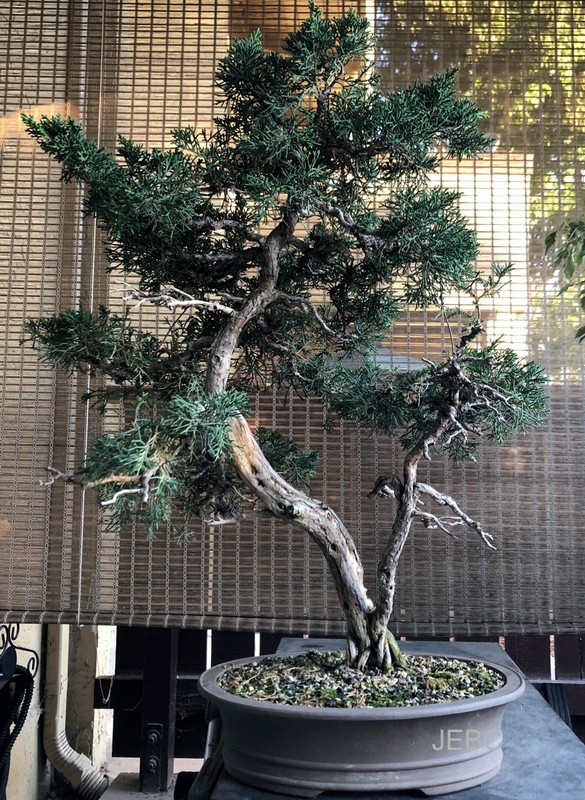 Another old Shimpaku juniper originally styled from nursery stock by an early Japanese master for its original owner. It has experience heat trauma and has weak root mass. I have been keeping it cooler and in a cooler pot while it redevelops in foliage mass. Early this year I jinned another weak branch that just seemed to be taking energy away from the tree. Oaks are great fun here. They grow well. This year saw major changes in the Daiymo and Cork oak trees. The Daiymo went to show with a new design earlier this year and then was altered to create a more compact growth. It is full of leaves now, has a new closer top, but still has an awkward branch that will be removed next year when I can see the new buds start. 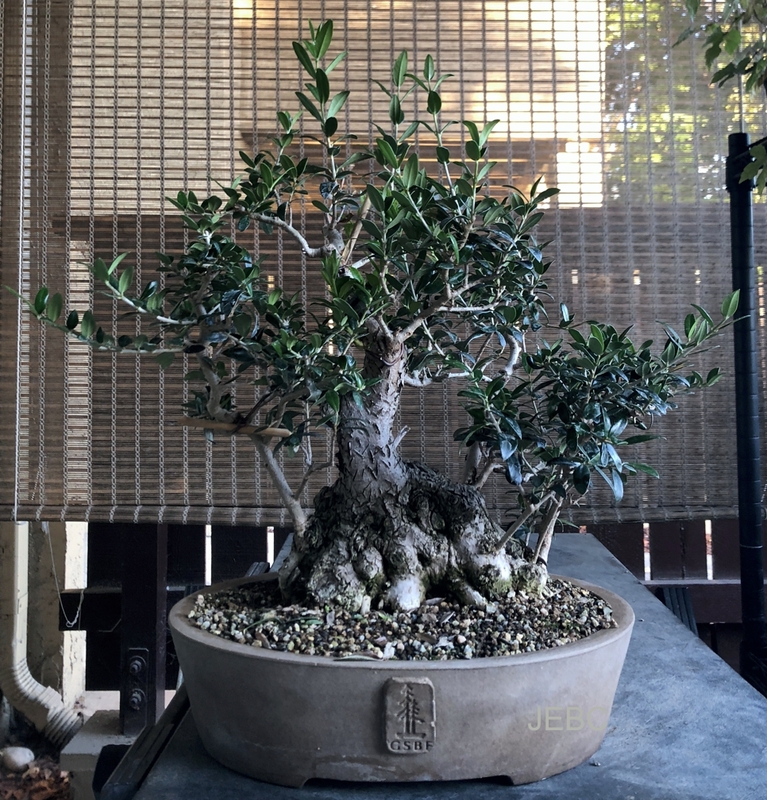 The Cork oak was re-potted and they always sulk. This one came out of its shock amazingly fast and is starting to fill out. Next year it will have substantial structural wiring and then be left alone to grow the new foliage and encourage root development. 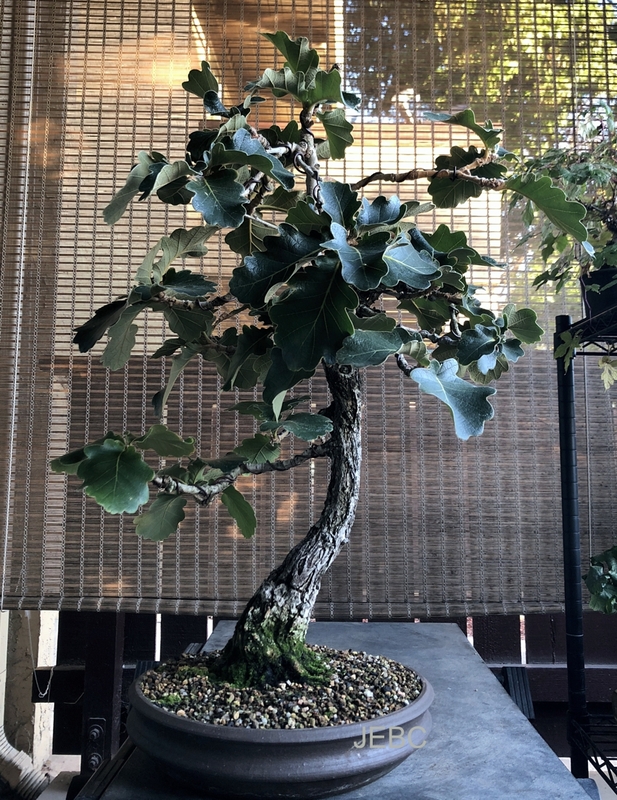 58 year old Daiymo Oak responding nicely to a new pot. It has had considerable growth this year. 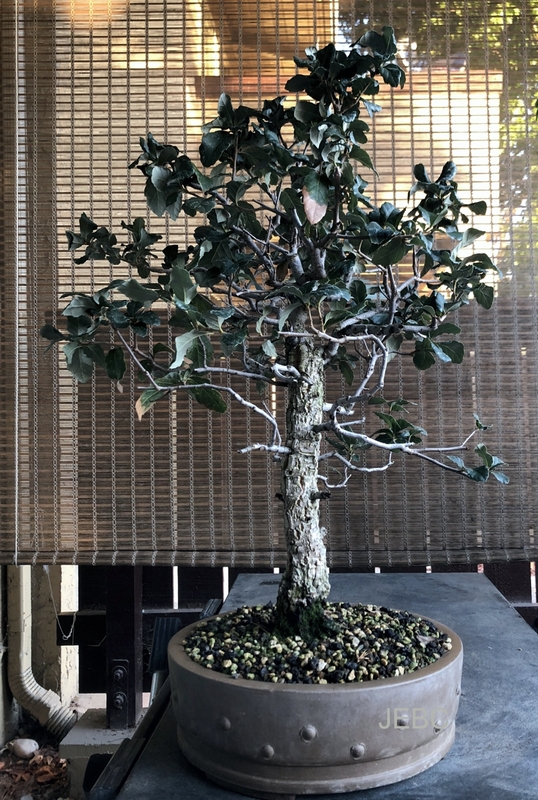 Cork oak has responded nicely to a new pot. I was so happy it did not lose to many leaves and began putting out new growth. A check on the Gardenia show the tree has bounced back nicely. When it arrive in the collection weak and nearly in full bloom, I knew it had to be reduced, re-potted, and allowed to gain its energy back. It came from a popular nursery during mother’s day sale so they were expecting it to just bloom as is. Those original blooms; however, were weak and only last a few days. Therefore, I cut them all off! I reduced the foliage mass, completed the re-potting in the warm summer and now we see new branches and new foliage developing. There is also one blossom on the tree. I will let that bloom and then remove it immediately. Gardenia after considerable cutback. Foliage and branch development is going well. This year I substantially altered my olive trees. They had all been re-potted last year. The one pictured here was decapitated. I did not like the strong upright center core. It was not fitting the base design and never grew branches were I wanted it to. I took the chance and cut it down so I could develop foliage and trunks lower on the tree. That is responding very well now with copious new growth. Olive is recovering from the removal of the large central trunk. 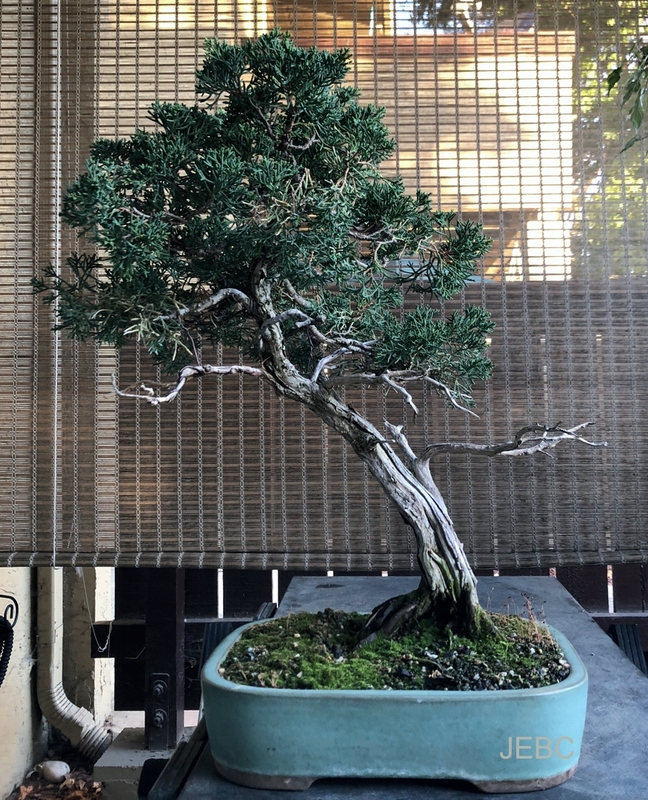 Checking in on other trees like the Sierra juniper that has been allowed to grow after show; it will be visiting its original designer, Master Mitsuya from Japan in a few weeks. I need to remove exiting wire from the tree before that session. Never want to waste the master’s time removing wire on a tree just to to wire it again. Time if valuable. Also shown below is a California juniper created by Lonnie McCormick many years ago. 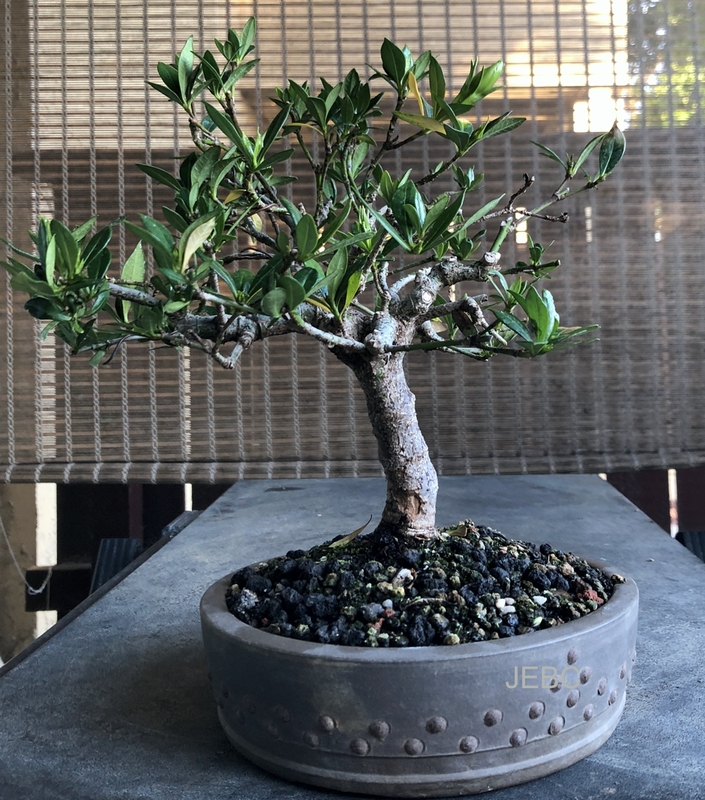 After his passing, I acquired it as a little stump and very little foliage. Today it has developed several new trunks and has some basic structural wire added for shape. Sierra Juniper growing very well this summer and ready for the master’s touch. 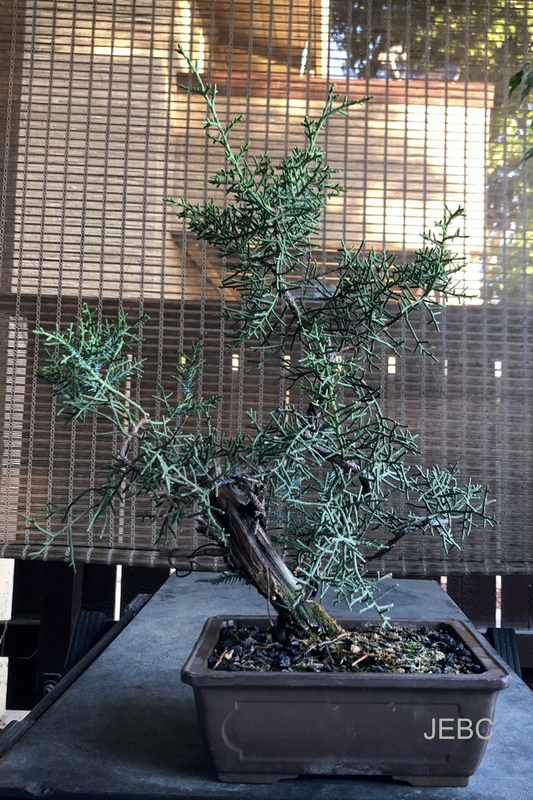 This is my little California juniper. It increased 50% this year with more aggressive fertilization. One issue with that plan was the increase in juvenal foliage development. That will be removed later next year.